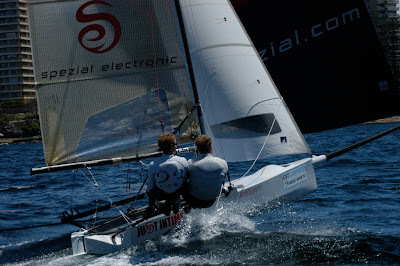 Teams racing is under way at the CST Composites International 14 World Championship on Sydney Harbour. Day One was staged in near perfect conditions in North Harbour adjacent to the host venue of the Manly 16ft Skiff Sailing Club. The teams racing is being held over a compact windward leeward course, with back to back races. Australia, Germany and Great Britain all put in strong performances throughout the day held in a 12-18kt sou’easter. 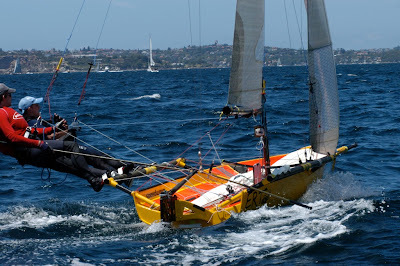 Australia B team skipper Ben Austin and crew Peter Nicholson were strong performers in their Beebe hull Dimension Polyant. Ben has a background in sailmaking and built a new set of sails for himself and made numerous modifications to a boat that is showing good speed. “We were working until 2am this morning and got going again at 8am,” Austin said. “But, yeah, the boat is going ok.” Of the German boats Axel Reinsch of Goldfinger was another good performer who said the breezes today were perfect and “ideal for us”. Reinsch and his crew Felix Weidling certainly reveled in the conditions and were looking forward to Day Two of Teams Racing. Other standouts for the day were defending champion Archie Massey and Dan Wisldon inGeorge 1st (GBR), Lindsay Irwin and Andrew Perry in Ronstan Irwin Sails (Aus) and Ron Scherwinski and James Lanati in Ray White Flaunt It (Aus). Day Two of the Teams Racing is to be held on 30 December with good conditions expected. Day One Summary: Perfect conditions, 12 to 18 knots! 6 teams, 24 races completed, involving 8 flights of 3 races per flight.